This is more of a knife and fork appetizer geared to a small plate menu or predinner course. Chef Crary complements crisp broccolini—a vegetable that's trending on menus—with creamy burrata cheese and nutty romesco sauce. The combination provides both texture and color contrast. 1. Roast cherry tomatoes at 450 F for 5 minutes or until they split; set aside. 2. In bowl, toss broccolini with 1 tablespoon olive oil. Place on sheet pan; roast in 400 F oven for 5 to 7 minutes. Set aside to cool. 3. For romesco sauce, roast red peppers over an open flame or grill until skin is completely charred. Place peppers in a bowl; cover with plastic wrap for 5 minutes. Cool peppers. 4. Peel charred skin off peppers; remove seeds and place peppers into food processor or blender container. Add 4 roasted tomatoes, roasted garlic, toasted walnuts, olive oil and sherry. Blend until almost smooth; season with salt and pepper to taste. 5. 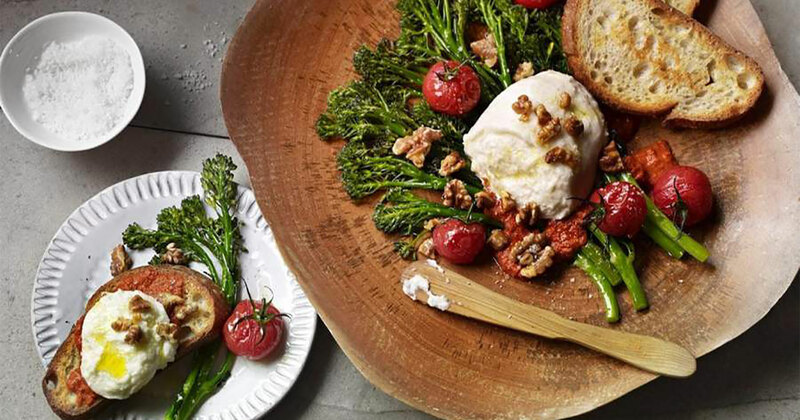 To serve, arrange broccolini on a small plate; top with some burrata, toasted chopped walnuts and dollops of romesco. Garnish dish with roasted cherry tomatoes; drizzle with olive oil and season with salt and pepper.